Dryline setup with modest to moderate instability and directional shear across eastern KS and OK. Targeted northeast KS where surface winds backed a little better and where terrain would be better than further south. Left home the night before with Jennifer Brindley making for Hiawatha as our initial target. Intercepted developing towers south of Hiawatha and drifted north with maturing supercell, encountering golfball sized hail in the core. 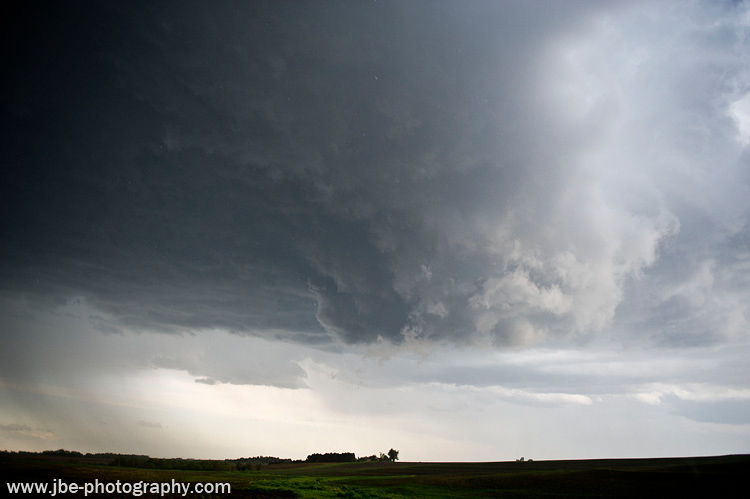 Gambled with an intercept before crossing the Missouri River and noted rapidly organizing rain free base with wall cloud that spun off a funnel on its southern flank. Attempted to race wall cloud north on road with poor visibility and wound up in the path of a rope tornado, 600 feet in front of us. 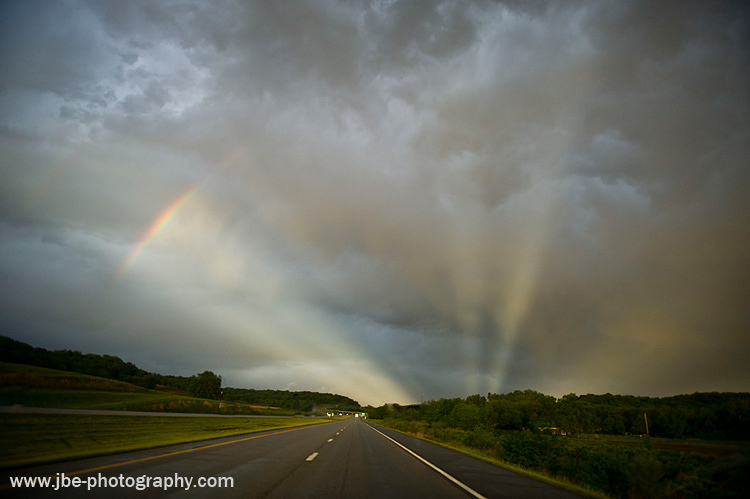 Avoided tornado and made it to Rulo, NE river crossing before catching gorgeous and unusual optical effects on the back end of the storm over St. Joseph, MO. 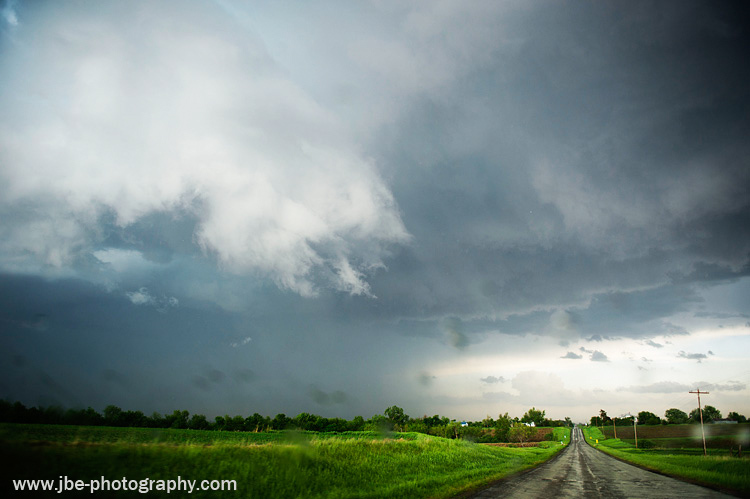 Saturday, May 21, kicked off a two day severe weather event out in the plains. A rich moisture axis was forecast to develop over eastern OK up to southeast Nebraska with a shortwave trough bisecting it along the OK/KS border and a surface low up on the western side of the Dakotas. A dryline was forecast to extend down the eastern side of KS and OK with a diffuse warm front draped eastward across Nebraska and Iowa. With modest instability and directional shear, forecast tornado probabilities looked like they would be on the low side. However, when its May and you've got a two day weekend setup on the plains, you chase. I decided to target the northern end of the setup, where the surface winds backed a little bit more closer to the warm front for better directional shear and the terrain would (hopefully) be a little better in northeast KS as opposed to eastern OK. I picked an initial target of Hiawatha, KS on the nose of a dry punch which would likely be the focus for afternoon thunderstorm initiation. 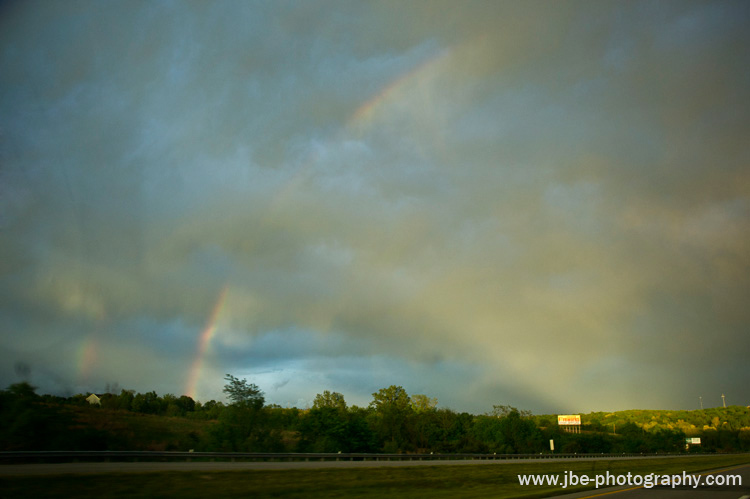 Jennifer Brindley, a wedding photographer, had a rare spring weekend with no weddings booked, so she decided to team up with me for the chase. We departed from my place the night before, taking 55 down to 72 and then 36 into Missouri, stopping in Hannibal for the night. We were up early and rolling the next morning, wanting to hit our target area a few hours early in case initiation was sooner than expected or we had to adjust a couple hundred miles if the target shifted. We stopped for breakfast in the town of Macon at a local diner where all of the customers would have been suitable for one of Brindley's "local portraits." After our fill of Macon bacon, we were back on the road and heading for Kansas, crossing the Missouri river just before noon. We made it to Hiawatha and stopped for lunch, this time at the Subway, as the local diner looked a little too shoddy. We hung out in the Subway for awhile, enjoying the air conditioning as the van had none before we headed just west of town to watch the sky. The dry punch was surging northeast as forecast and a nice cumulus field had developed overhead, extending west and to the south along the edges of the dry punch. 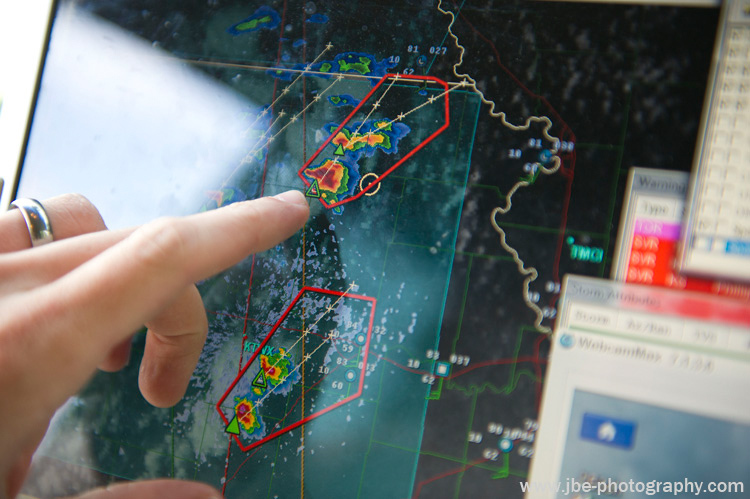 It was just a matter of time before storm initiation. We wound up being a few hours early to our target, but that's vastly better than being a few minutes too late. With the relatively low tornado probabilities, the Storm Prediction center wound up issuing a severe thunderstorm watch (or a blue box) instead of the coveted tornado watch (red box). We were hearing rumors of towers going up to our southwest and sure enough within a few minutes we started to see the first returns on the radar. A few cells went up and we held our ground to see which would become dominant before we dropped south about 20 miles to our targeted cell. There was towering cumulus going up all around us and it became clear when we arrived that the cell needed a bit longer to mature. We tracked it back up north and stopped south of Hiawatha to watch the storm mature. We hung out on the east side of the storm for a good twenty minutes as the high based thunderstorm slowly organized into a severe warned supercell. Lucio, Neal, and Williamson passed us with a honk and some waves heading north toward Hiawatha, and eventually we drifted northeast with the storm as the precipitation core started to encroach on our position. 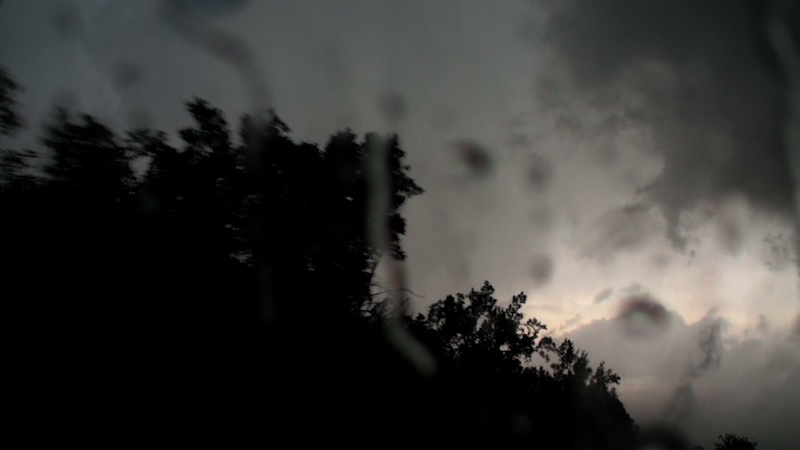 We stopped inside the core of the storm with base visible through the rain curtain to our southwest. The hail picked up and we had a few golf balls pinging off the van, which I stopped to report on Spotter Network before we cut through Hiawatha to get on the base of the storm. Along the way I picked up Scott Bennett on the ham radio caravanning with Adam Lucio's crew and I followed them into Hiawatha. 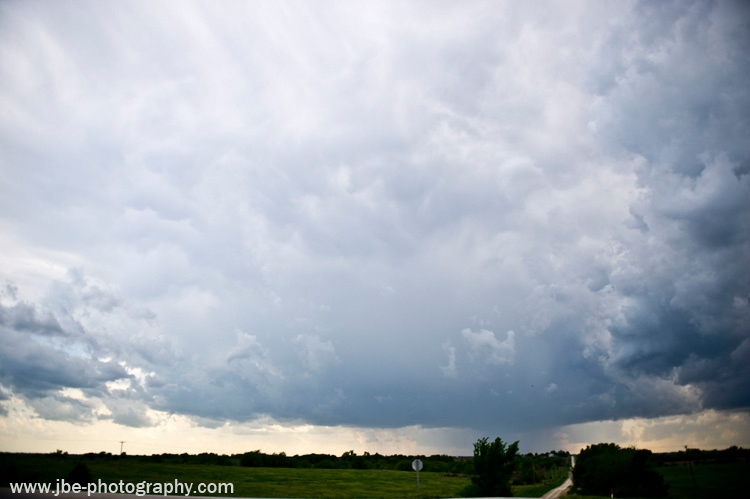 We finally had a view of the updraft base once we were past town. It seemed rather high, cold, and outflowy but there was dramatic contrast and color with it. Our storm was still only severe warned, and with the low probabilities and marginal parameters I feared our storm might have peaked. 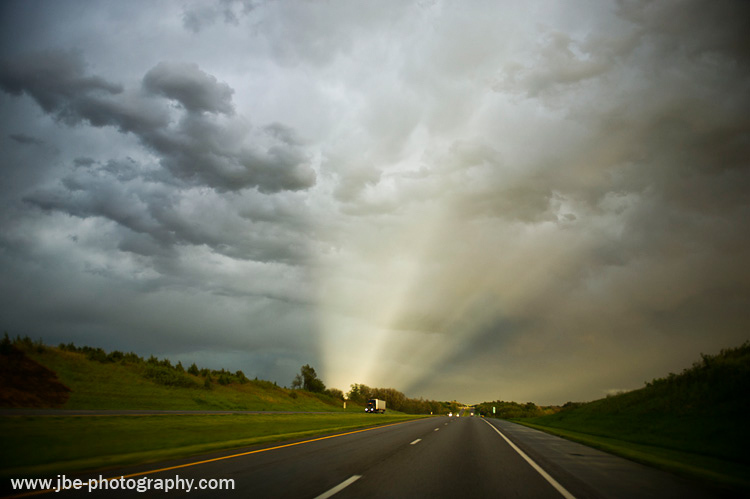 With the storms east northeast movement toward the Missouri river, we were all faced with an agonizing decision that plagues chasers on many a chase. With few river crossings, do we make for the crossing now, and catch the storm on the other side, hoping it doesn't produce in the meantime, or do we stick with the storm in the short term and gamble that it will produce, knowing that we have to give it up when we hit the river? Be it the Missouri or Mississippi it seems storms always want to peak right over the river. Adam and Scott made the call to head for the crossing and headed north directly out of town. Brindley and I drove a couple miles west of town playing with the gravel road grid, to watch the storm first before we made up our minds. The base of the storm was getting quite photogenic and I wanted to stop and get some pictures of it before we left it for the river crossing. Our gravel road turned to mud, however, and not wanting to repeat our May 10 incident where we got stuck I was able to back down the road back to the gravel before we got into much trouble. I decided to make for the crossing. 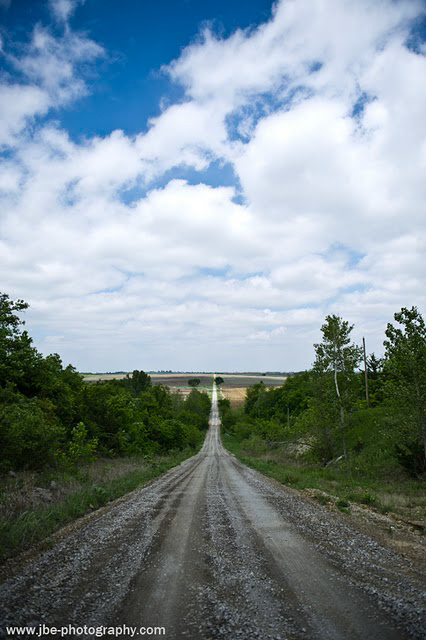 I turned the van around and we started heading back toward the north highway that would take us into Nebraska for a crossing into Missouri through the town of Rulo. A mile down the road however, the base of our storm started to push out into a classic horseshoe shape as the rear flanking downdraft surged in behind it. A ragged but dramatic lowering started to form as well. I stopped the van. We were chasing this storm now. 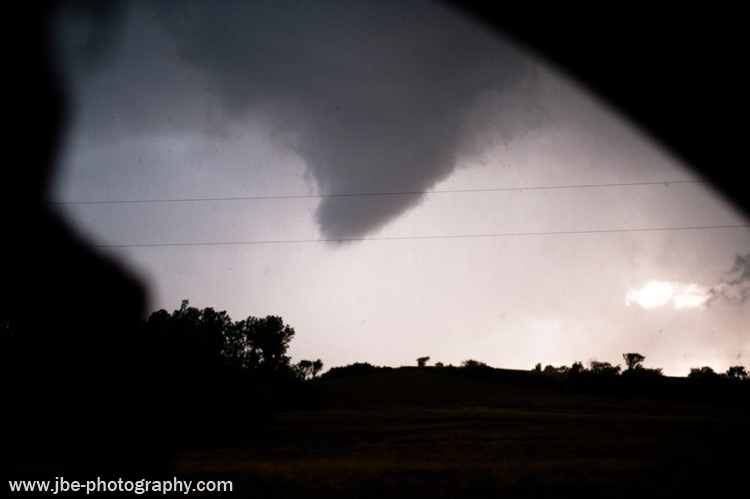 I turned the van around again and we headed east a few miles following just behind the lowering, underneath the RFD clear slot, watching it further lower. Pointy teeth reached down from the backside of the lowering and I was just waiting for them to condense all the way to the ground, but they held off. Not wanting to get caught in the rear flanking downdraft or get stuck on a shoddy road, we dropped south a couple miles to a paved road before heading east. We had just ten miles to play with before we hit the river and had to go a good fifteen miles northwest away from the storm to get to a river crossing. The base of the storm bowed out right over head. 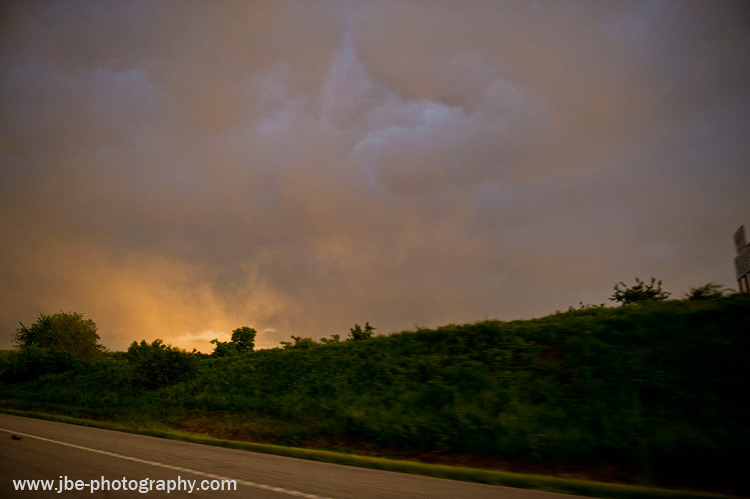 White wisps of scud swirled overhead, making Brindley and I uneasy as we drove underneath them. 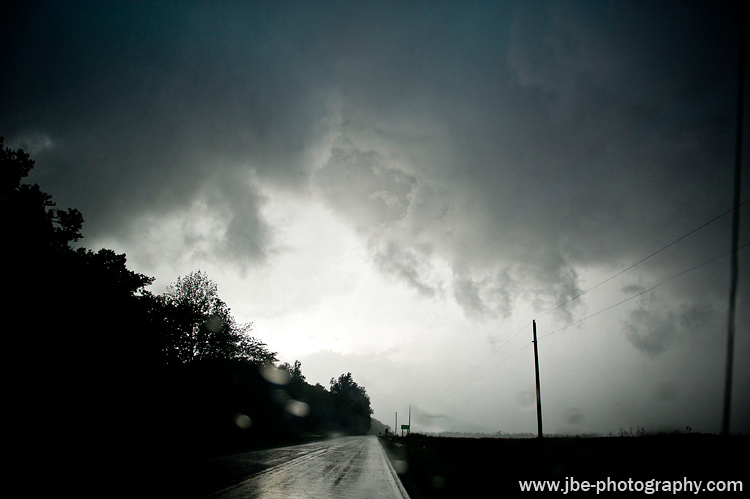 I assured her it was just wisps of scud and wouldn't touch down and we continued on, pulling ahead of the storm. As we passed the wavy base, the structure looked quite similar to the Bowdle storm just before it produced its first tornado. 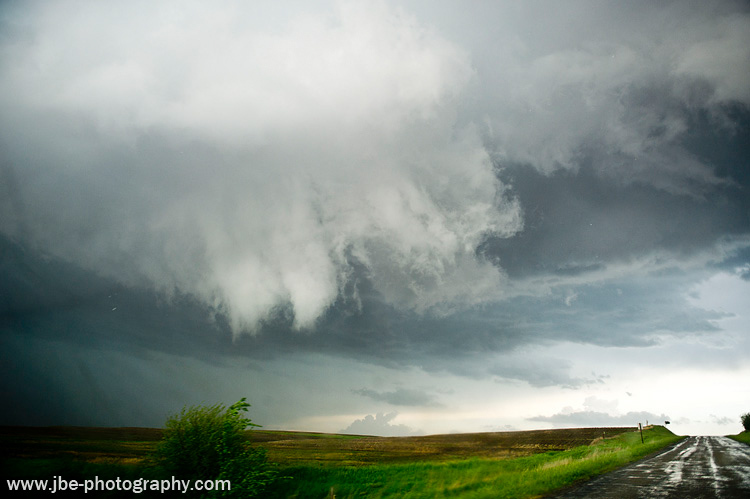 I spotted a large, classic wall cloud developing under the base of the storm off my left shoulder as we sped away to the east and the storm drifted slowly north away from us. Finally a tornado warning was issued on the storm. 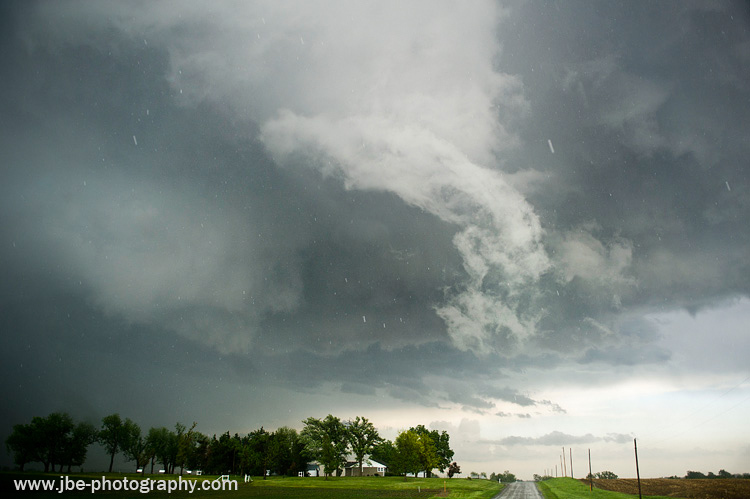 Rain filled in under the rear flanking downdraft clear slot and we lost our good view of the wall cloud. There was one north south highway that ran along the river and it was our last option before we had to make for the crossing. The plan was to head north, and get in front of the storm, in the inflow notch, for one last shot at an intercept before we had to leave it. We made it highway 7 and turned north to catch back up with the storm. 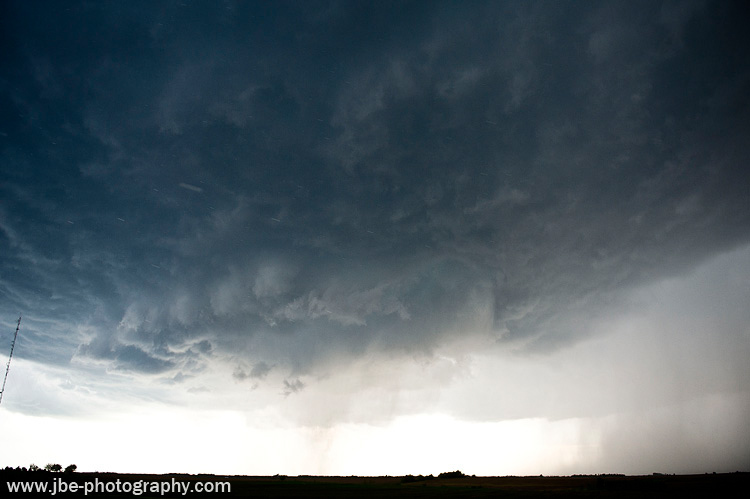 The wall cloud seemed like it was being cleaved into two halves, with large left and right lobes. 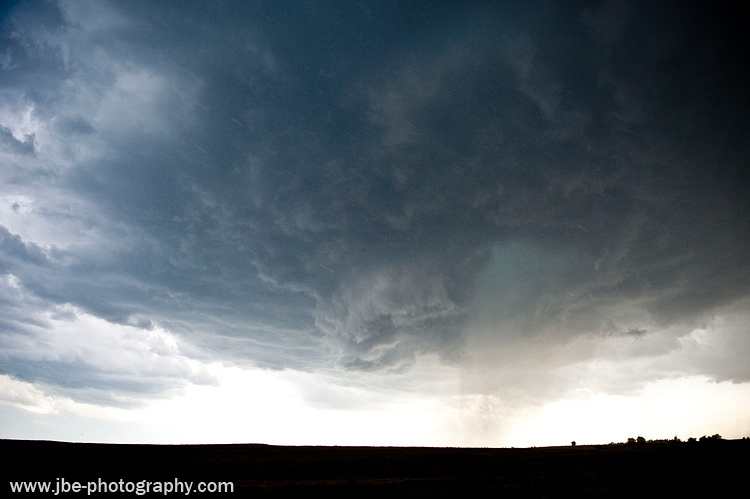 The structure reminded me of April 22, 2010 in the TX panhandle where a large but weakly rotating tornado split off the southern portion of the wall cloud. The terrain along highway 7 was becoming problematic as thick clumps of trees started our block our view to the west. Between the gaps we got good views of the wall cloud, but we would still lose our view if we didn't get in front of the storm. We continued north as the trees became a solid wall. We hit a break in the trees and realized were even with the southern lobe of the wall cloud and it was encroaching on us rapidly. The southern split in the wall cloud was rotating at a decent pace before it formed a nice cone shape and started to rope out while tightening its rotation. 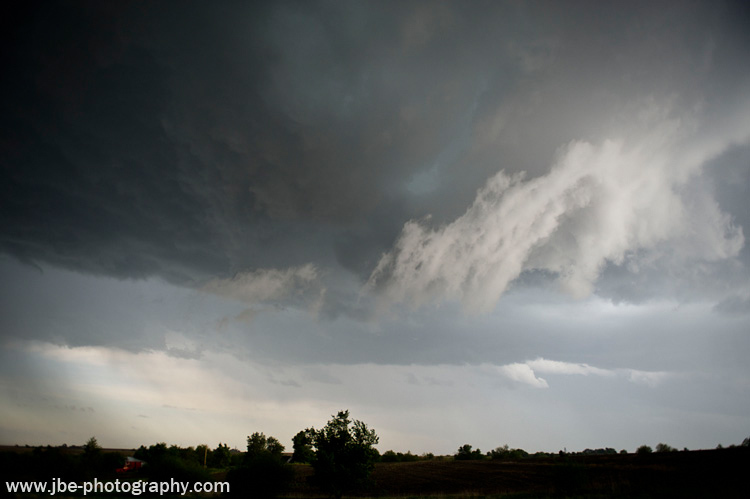 It was a large funnel cloud and it was moving overhead. 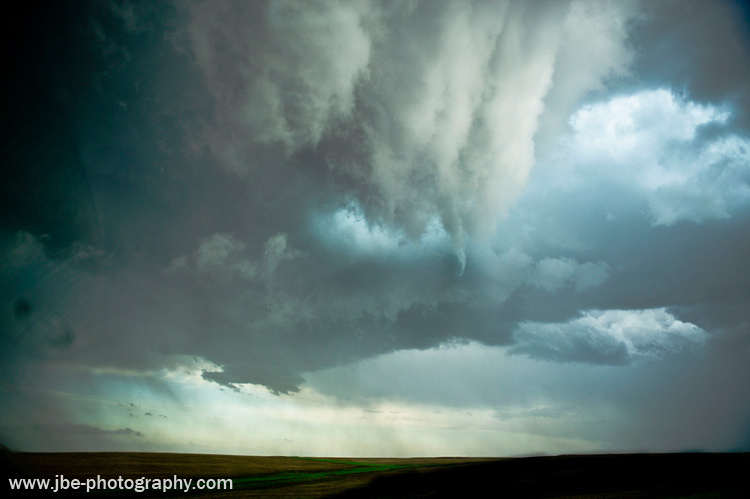 Being parked underneath a funnel is one of the most foolish positions you can be in while chasing. I looked around briefly to see if I should back up or keep going forward, and hit the gas a little to get further ahead of the feature. However, with the funnel way above our heads I realized I wasn't going to make much ground on it relative to the spot on the ground it was over before it passed. The funnel roped out right above us into wisps and then nothing, but I decided it probably wasn't wise to stick around in case it reformed. We were midway up the wall cloud which was starting to move overhead now, and we had little view to our west through the trees. Half trying to race the wall cloud across the road before we got stuck in the hook, and half just trying to get a view of what we were driving under, I continued forward. Our only view was straight ahead and off to the east across the river's floodplain. 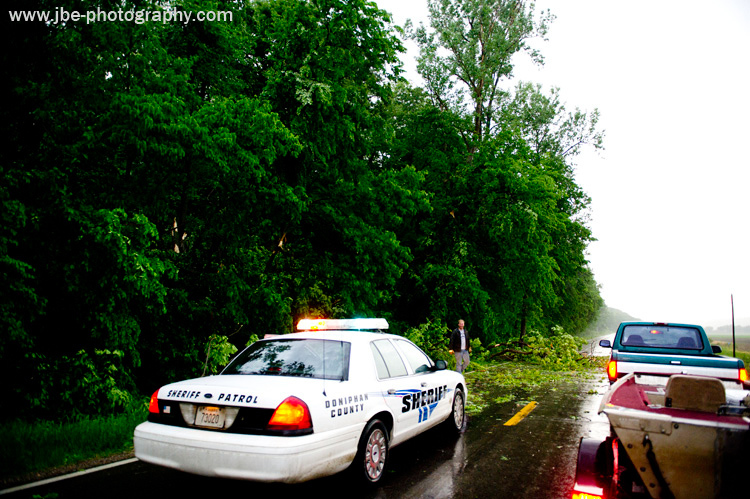 Thick trees lined the road blocking our view of the west sky. 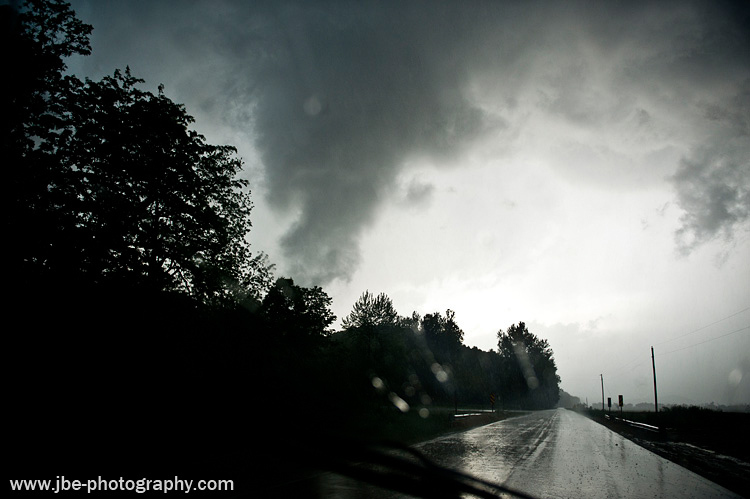 Large, very low fragments of scud dragged under the wall cloud crossed the road ahead of us. Brindley was a little apprehensive about the low clouds, but I (foolishly in hindsight) assured her it was just scud and not any sort of threat. We continued on pushing deeper into the bear's cage, still struggling to find a view of that west sky. There was a lot of scud now and it was moving in different directions. 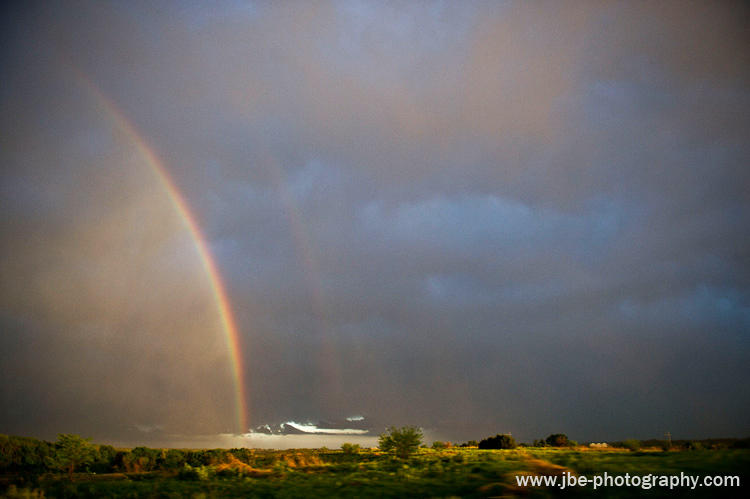 I stopped and jumped out of the van to get a bearing on the sky. I looked around and didn't see anything that screamed imminent tornado. There was no tight rotation anywhere that I could make out. The air actually felt like outflow. 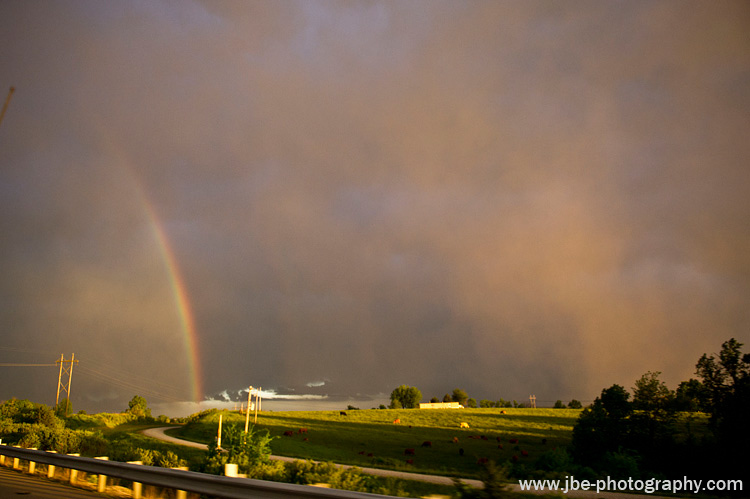 It was very moist, but it was also cool and seemed to be blowing out of the storm. I got back into the van and reassured Brindley that the storm was probably outflow dominant. Gusting out cold air and that's what was kicking up all of the scud. 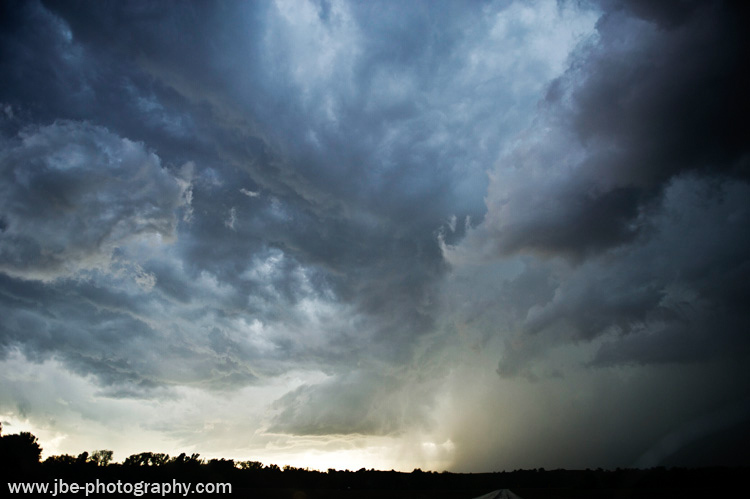 A large hunk of scud with a ragged bottom was off to our northeast moving east away from us. It was connected to the wall cloud's base, but it wasn't rotating. 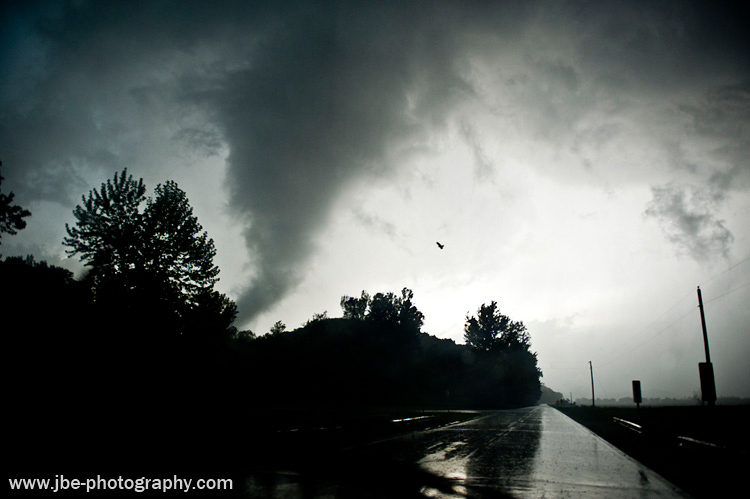 There was another thick piece of scud just behind it, straight up the road from us. We could also see the ground underneath it, and it was cut off midway to the ground with a ragged flat bottom, also not rotating. 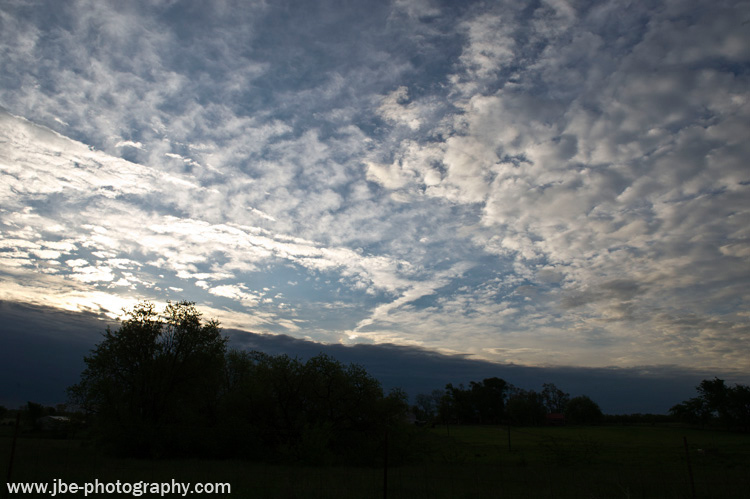 A third chunk of cloud (pictured left) was connected to the wall cloud behind the first two, but over the thick trees to our west. I could not see the ground underneath it. It looked just like all the other low hanging clouds, though, so I assumed it was just like the others. Still we pushed further, now angling to pass right under the lowered scud clouds, getting north of the wall cloud and into a hook slicing position. The trees gave way to our left for the first time since the funnel we spotted earlier, and as they receded we could trace the edge of the lowering as it extended downward. The feature was not cut off midway down like the first two. The condensation went all the way to the ground, the base twisting wildly in a corkscrew pattern. This was no scud. 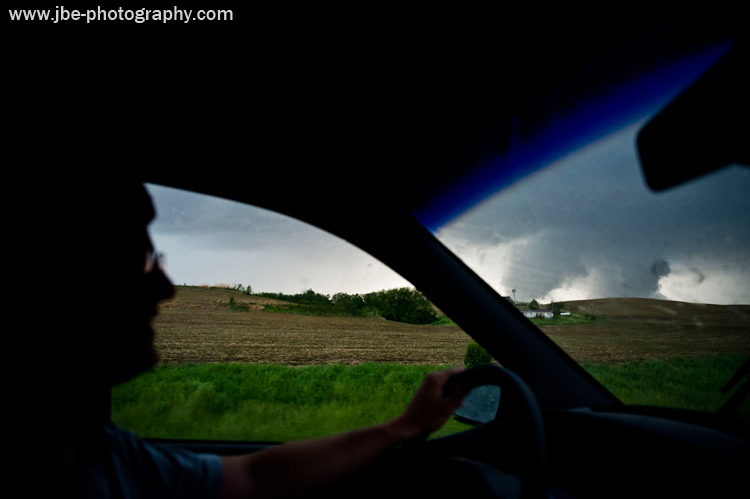 I was stunned to see a tornado in front of us. 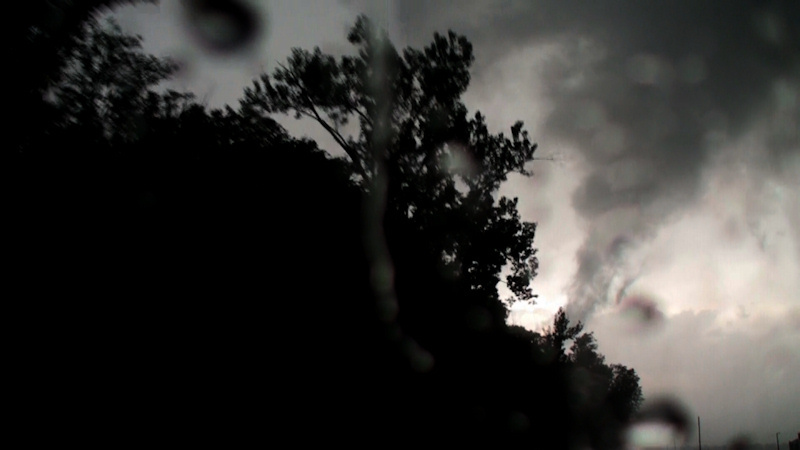 I stopped the van and hit the pan controls on the camera dome to make sure the tornado was in the frame. 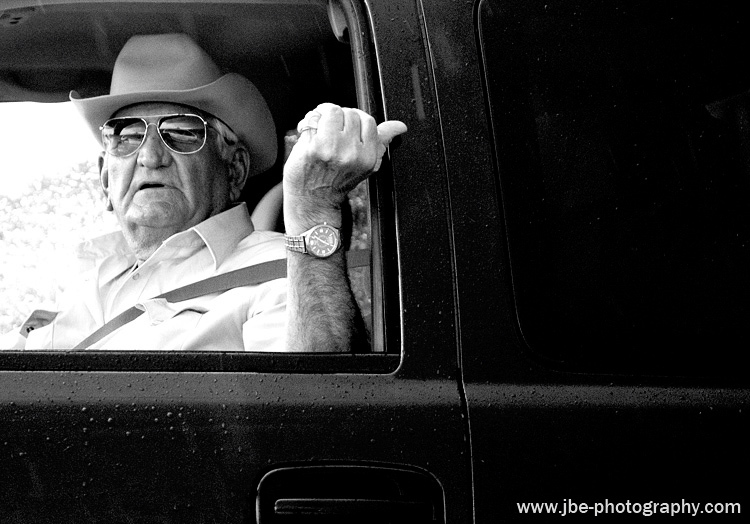 We had to move immediately as the tornado appeared to be only a few hundred yards in front of us, but first I had to see which direction we should go. If the tornado was moving left to right it would pass in front of us and we'd back up a bit, if it were moving from right to left it would pass behind us and we should keep moving forward until we were in the clear. I watched it for a moment as Brindley fired off a few stills, and came to the sick realization that the tornado wasn't moving in either direction. It was coming straight at us. I put the van in reverse and pushed the accelerator to the floor. The van jumped backwards but topped out at an agonizingly slow speed. 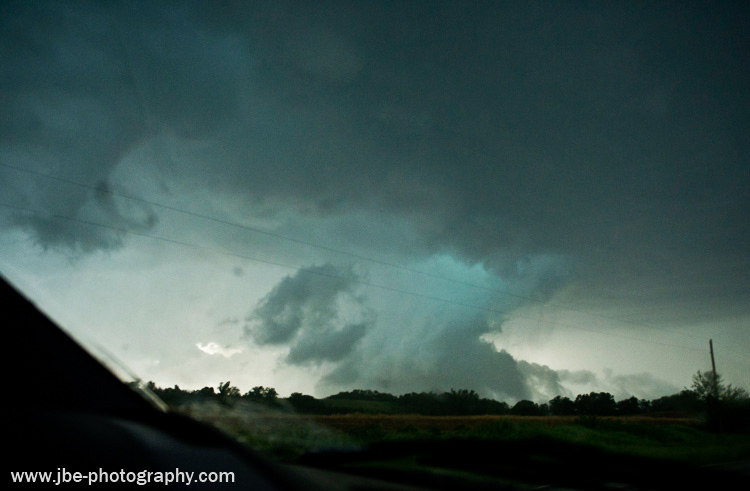 I was no longer watching the tornado, fixated on the back windshield to see where I was going. "Which way is it moving!?" I shouted to Brindley. "I don't know!" was the reply. I swung the van around and did a three point turn as quickly as I could manage before hitting the accelerator hard again and speeding away from the tornado. 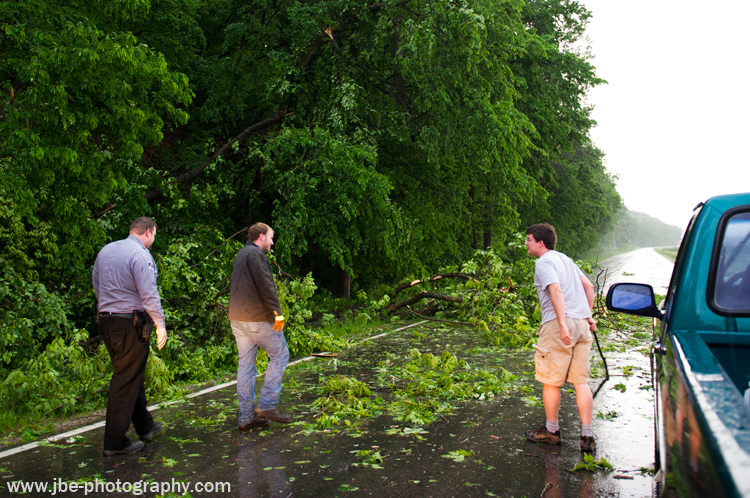 We cleared the tornado's path and kept going down the road as the tornado was crossing the road at angle toward us. 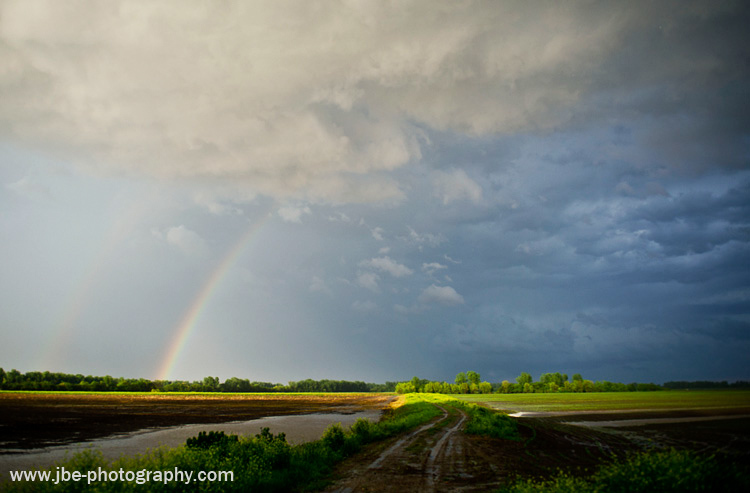 I could see the tornado roping out behind us as it crossed the road and moved into the floodplain. I drove us down to our paved east/west road that we were on earlier, thinking we'd make for the original river crossing route to go around the storm. We realized that the storm would be well off to the east by then though, so we might as well just take highway 7 up to Rulo. We paused to gather our thoughts and cool our nerves. We were both shaking from our close call. 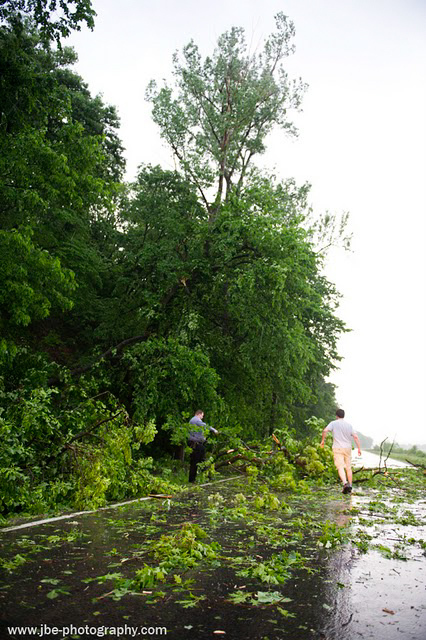 We found where the tornado crossed the road and there was a good sized tree down. We stopped and I measured the distance of the damage path from where we had originally stopped when we first spotted the tornado: 600 feet. That was definitely the closest both of us had been to a tornado, and it was all the more nerve racking since we were in the path. 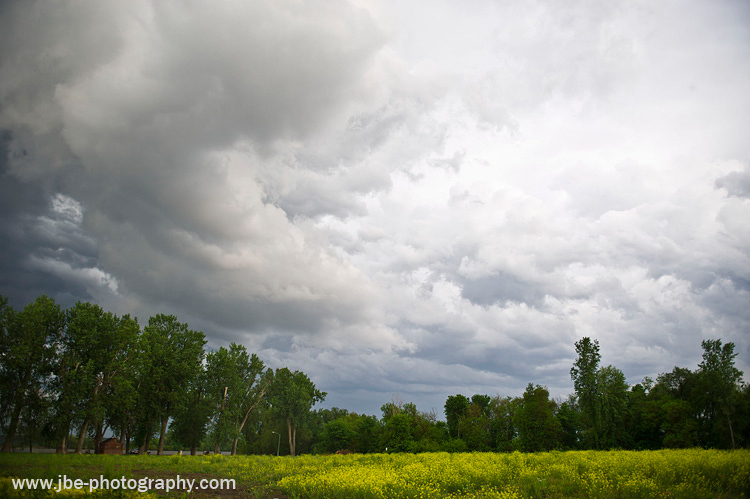 Had we not paused to check out the clouds before we saw the tornado, that tree might have landed on us. Helping the locals, we were able to get one of the lanes open on the road, but a crew would have to come back with a chain saw to get the rest. When the lane was cleared we continued on up 7 toward Rulo. We made it to Rulo, Nebraska and made for the bridge across the Missouri. 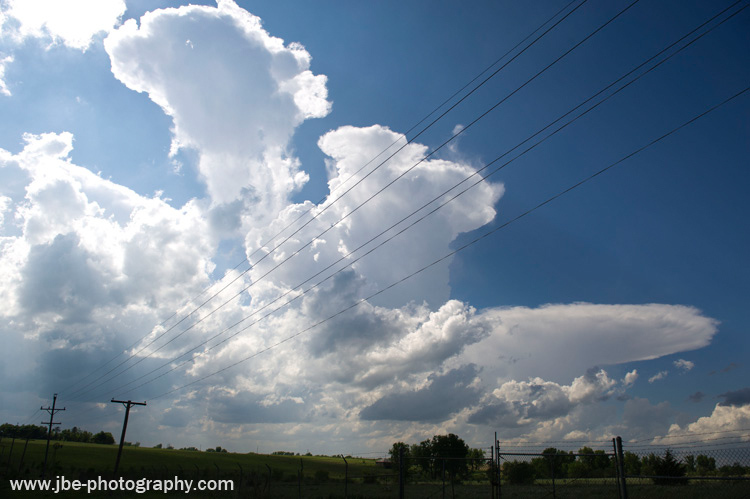 Some towers were going up in the wake of the storm and I was surprised to see there was enough instability left in the air that we were actually getting some hail out of them. As expected, making for the river crossing took a good deal of time while the storm left us behind, racing into Missouri. Well behind the line of storms our chase was over, but Brindley and I were still in awe with our dramatic tornado encounter. 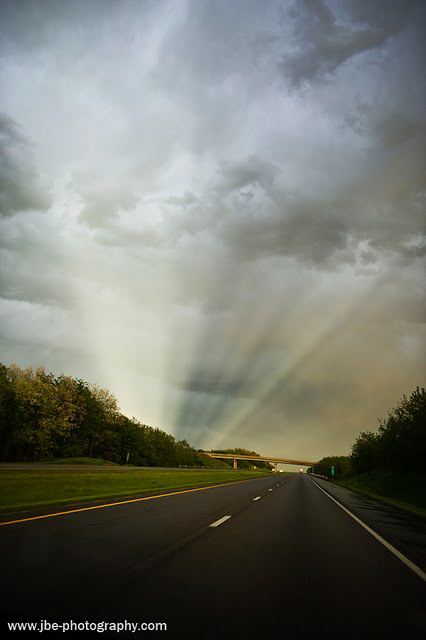 Beams of light appeared to be emanating from the ground on the southeast horizon. They'd almost make sense if the sun were setting in that direction, but the sun was setting behind us, so the beams of light seemed quite out of place. It was like there were giant spotlights on the ground. The view was otherworldly. A bunch of nutjobs had been prophesying that May 21, 2011 would be the date of the biblical rapture. Brindley and I scoffed that we had survived it after our close encounter with the tornado, but the weird beams of light coming out of the ground were starting to creep us out. We half joked with each other: "So, is it a bad thing that we're not in that bright light over there?" Meanwhile the sky over St. Joseph became a fiery orange. It looked like the entire city was on fire. If the rapture was actually going to happen, I thought this wasn't a bad approximation on how it might actually look. 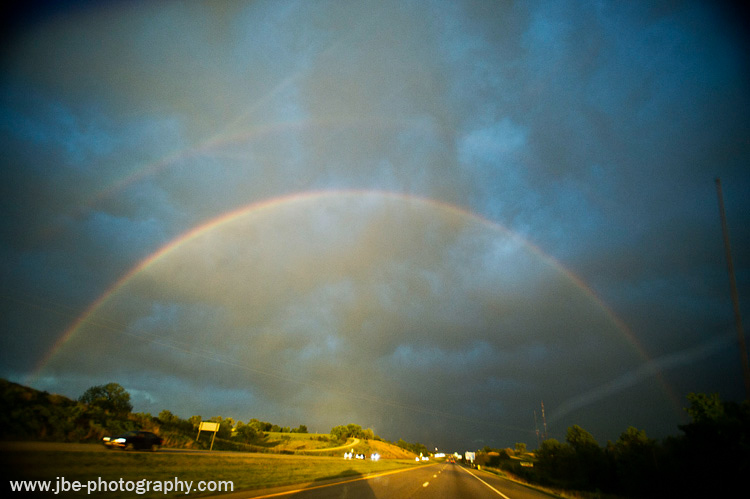 The light beams fanned out across the sky before finally fading while the rainbows intensified. We stopped at the Texas Roadhouse to celebrate our chase, surviving the tornado and the rapture (which apparently is a bad thing), with a steak dinner. A severe warned lined of storms hit the restaurant while we were eating and we were treated to another barrage of rain and lightning before we left to find a place to spend the night. What we thought was going to be a relatively modest chase day, turned out to be one of our most dramatic tornado intercepts of the year. Up to this point, it was my closest encounter yet with a tornado, and also the first time I had caught a tornado in a severe thunderstorm watch. The tornado did a modest amount of damage and was probably rated lower on the Fujita scale as a 0 or 1, missing the nearby towns and doing mostly tree damage. This chase was nearly perfect. We made a good forecast, were on our storm at initiation, caught some dramatic structure and of course the tornado, and then were treated to gorgeous sunset skies with surreal optical effects, before celebrating with steak dinner. 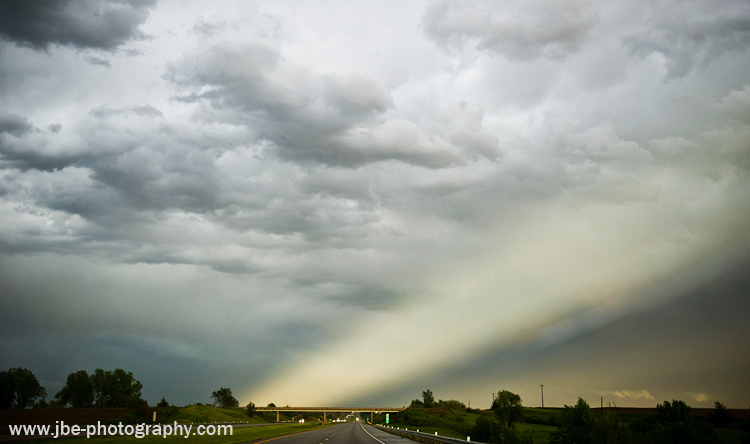 Do not try to race wall clouds using roads with poor visibility. Pause and look at the sky before you jump into the storm. Highway 7 in northeast KS is a poor intercept route.